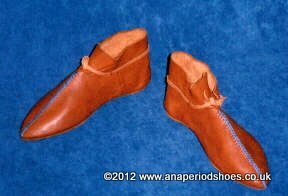 ﻿ Make your own Medieval Shoes Footwear, No specific experience in leatherwork is required. I offer residential workshops where you can make your own medieval shoes. I am at present allowing 4 days for the course although I think that it could be done in 3 days by people with good manual skills, but only time will tell. The assembly of a pair of medieval turn-shoes. The lasts are sized up, the pattern has been made and the leather has been chosen. 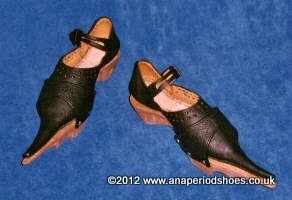 You will have access to all the tools and techniques required to make a pair of authentic medieval turn-shoes. Just attending this course will NOT turn you into a fully fledged shoe-maker. The level of work you will be doing is comparable to advanced apprentices tasks within a medieval guild context. You will be doing the work yourself, not just watch me. No specific experience in leatherwork is required. BUT you must bring some manual dexterity or experience in other crafts with you. Suitability is best assessed through having a chat with me and by showing (or emailing) me samples of work that you have already done. This is not essential but desirable - after all we will be spending four days together. You can just pop round my stall at various events to introduce yourself and I can then measure your feet in person too. Approx. 3 hours in the morning and 3 hours in the afternoon. However this is a very beautiful part of the country and you might want to see some of the sights. I am happy to move the afternoon class into the evening if the entire class wishes to reschedule this way. When we work we work, and when play we play. I expect you to be present for the full duration of the classes and be focussed on the work in hand. This way all members of the group will be roughly at the same work stage. And this way I will be able to teach you more as I won't have to repeat myself unnecessarily. Having said that, of course I will support you in working at your own pace and give each person the attention that they specifically need. What I am objecting to is people who cannot be bothered to show up for class and then expect everybody else to synchronize with them. And yes, of course there will be tea breaks - with biscuits - this is Britain after all. £450.00 per person including all materials. To keep this course affordable I let you stay as a house-guest free of charge. There are guest mattresses in my converted loft. You can bring your own bedding and use my kitchen for self-catering. This is FREE, so please clean up after yourselves. Don't do things that aren't legal or might annoy the others. No smoking and no TV (I haven't got a TV license, but you can watch DVD's). There is free Wifi in the house but you need to bring your own gadgets. And clean up after yourselves and go easy on the alcohol. Quiet time from midnight till 8am. If you wish to bring along non-participating child or adult family members, please discuss it with me first. Just talk to me and I will be able to tell you if I can accommodate your needs and ensure that you will have just as much fun as the rest of the group. You can block-book as a group of 3-4 people or you can book individually. To register your interest just contact me and I will keep you informed of potential dates as and when they become available. It is possible to spread the course over 2 weekends.